The use of telemedicine for family practice and a variety of specialties is exploding. By the end of this year, more than 7 million patients are expected to have used telemedicine. Video visits are popular with patients for a variety of visit types including follow-up visits, medication management, dermatology, and urgent care. Behavioral health is one area where telemedicine is poised to have a significant impact increasing practice efficiency and streamlining access to care. Why does telemedicine make sense for behavioral health practices? Video visits take less time than in-person ones and eliminate many time-consuming administrative tasks. This lets practices spend more time with patients or see more patients each day. These efficiency gains can increase practice revenue without any additional administrative overhead. The ability to see patients from anywhere gives providers a great deal of flexibility. They can work from home or expend hours into the evenings or weekends. Many mental health providers find that this additional flexibility improves work/life balance. Survey after survey shows that patients are happy with the telemedicine experience. In fact, millennials are increasingly using the availability of telemedicine when selecting healthcare providers of all types. By eliminating barriers to care, video visits improve patient outcomes. Patients can receive the consistent care which is so vital to treating behavioral health issues. Medication management is simplified, and patients are more likely to engage in the management of their own mental health. Because behavioral health visits tend to be more lengthy than typical medical visits, no-shows and last minute cancellations are a serious problem for mental health providers. Video visits eliminate many of the issues such as trouble getting time off of work, transportation problems, and child care availability that cause no-shows in the first place. When you eliminate proximity as a factor in choosing a provider, you expand your pool of potential patients significantly. In addition, the option of telemedicine makes it possible to maintain existing patient relationships even if the patient moves or you do. What types of care can be provided via telemedicine? Studies have shown the telemedicine is an effective treatment delivery method for depression and PTSD. It is used in other areas as well including career counseling, coping skill development, family conflict, grief counseling, life coaching, medication management, and trauma. Why is it so popular with behavioral health patients? Patients seeking assistance for mental health concerns love telemedicine for the same reasons that those addressing medical problems do. It is convenient, it reduces costs, and it expands access to a larger number of providers. These patients also have some unique concerns about the confidentiality of their care. A HIPAA compliant telemedicine program alleviates these concerns, allowing patients to receive treatment right from the comfort of their own home without any risk of being seen seeking help from a behavioral care provider. The goal is to make you more efficient, not to add another complicated technology layer. Look for a solution that will easily integrate with your current practice management system. We mentioned earlier that privacy is a primary concern for patients. The solution you select should have encryption technology and comply with all HIPAA rules. The vendor should be willing to enter into a business associate agreement. The best solution will import patient insurance information from your practice management system and verify that the video visit will be eligible for reimbursement for behavioral health care. Patients won’t sign up for telemedicine visits if they don’t know about, so look for a solution that automates patient marketing for you. Your telemedicine platform should be easy to use, but you and your patients will likely have questions from time to time. The best vendors provide customer support for both sides of the equation. 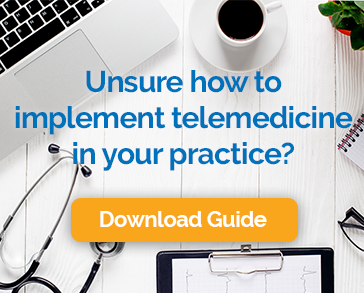 Adding telemedicine to your behavioral health practice is an easy way to satisfy patients, generate more revenue, and allow you to work on your own terms. With the right technology partner, it is painless to get started. You and your patients will begin enjoying the benefits right away.